Seeing this iconic picture postcard of Ron Clarke lighting the Olympic cauldron at the M.C.G in 1956 reminded me of two bits of trivia. Firstly, the well known fact that Ron Clarke had burnt his forearm while reaching in to light the flame, but the other bit of trivia is not so well known. During the Sydney leg of the journey, the Mayor of Sydney was fooled when he accepted a fake torch from prankster Barry Larkin. Barry Larkin, now a veterinary surgeon from Melbourne, planned to interupt the torch relay along with eight other students from St John's College, believing that the Olympic Flame received too much reverence. The fake torch was hardly a master forgery, which makes the fact that it was passed off as the real deal all the more humorous. The fake was made using no more than a wooden chair leg that had been painted silver, holding at top a plum pudding can. As for the flame, which proved to be far from a reverent affair, this was created using a pair of underpants, soaked in kerosene. 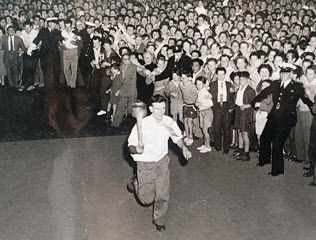 After a shaky start, Larkin ran with the torch to Sydney Town Hall protected by police who thought that he was the official runner, where he presented the torch to the Mayor of Sydney, Pat Hills. As the mayor was unprepared, he did not look at the torch and went straight to his speech. While Hills was talking, Larkin walked quietly away, avoiding attention. Hills didn't realise at all that the torch was fraudulent until someone whispered in his ear and told him it was a fake. Hills looked around for Larkin, but by now Larkin had merged into the crowd and escaped. In the 2000 Sydney Olympics, the media reported the story of Larkin's hoax. As a result, the police took measures to prevent the hoax from happening again. This included security guards lining the route. However, this was not popular as some people complained that they could not see the torch. Some hoaxers did try to disrupt the relay; two people attempted to steal the torch and one man tried to put out the torch using a fire extinguisher, but no-one succeeded. The Olympic Flame for the 1956 Olympic Games in Melbourne was lit at Olympia in Greece on the 2nd November 1956. Greek runners took the flame to Athens where it was then transferred to a miner's lamp and flown by Qantas to Darwin in the Northern Territory. From there, a Royal Australian Air Force jet bomber flew it to Cairns, Queensland on 9 November 1956. The first runner in Australia was Con Verevis, who was of Greek parentage, and then relayed down the east coast using diecast aluminium torches. 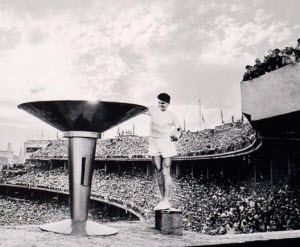 The flame arrived in Melbourne on 22 November 1956 and used to light the stadium flame by Ron Clarke.